I traveled North in ice a week ago yesterday. I came back to green hills, birds in trees, daffodils, new blossoms. It’s not too hot. It’s not too cold. The air is not infested with mosquitoes, not yet at least. It smells vaguely of chamomile and vanilla. Birds all sing as if they knew. Spring has sprung, momma. Spring has sprung. 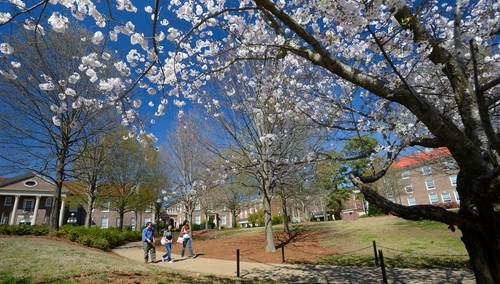 The campus of Ole Miss is gently warm. Students have exchanged parkas for shorts. Walking around is a stroll, not a dash to avoid frigid pellets. For those who haven’t already done so, it’s a good time to fall in love. As Tennessee Williams more or less remarked, young people love as if they were inventing love. The students here, all toned, fresh-faced, and tentatively swaggering, hair-flipping, giggling, are out in due season like the blossoms. They are all so very pretty. Even the nervous ones are pretty. The Greeks would have told you that Persephone had emerged from the depths of Hades once more. The country singers tell you that a girl in tight jeans is swinging her hips as she walks slowly by their truck, looking back with a longing gaze. I tell you something in the middle of these two declarations of what is going on here. Here is a poem from my forthcoming collection, out this April — The White Trash Pantheon — about this time of life and time of year. It originally appeared in Connecticut Review. Momma, I lied to you. And that old, ugly hunting dog with the funny name. He was giving me what you call the evil eye – but it’s not evil, Momma! The door. I hopped in. One true thing I told you – the Earth split open, and he floored it. As I please. The thing about the pomegranate seeds, I made it up. I get plenty to eat when I’m there – Can he ever cook! Out of the frying pan into the – but I don’t mind. I like it. The oil spatters, and my arms burn a little, and I shiver. He feeds me his funnel cake, which is thick and buttery. You think the new buds are so pink and perky this year? New schools of golden guppies? Spring has sprung, Momma. He doesn’t know divinity – that’s why the walls are bare. Growls at me, “Try me, baby! I like religious arguments! Mind washing the grease off everything afterwards. After he closes his kitchen after dinner. Oh, please! Maybe you can convince him about the God thing. Spring is all lilies, but it’s really about the mating. This is why Mississippi is so lovely this time of year. Love is being reinvented, often transgressively. The air is filling with bird cries. The warm air has brought out the frogs. The South awakes from her long slumber and shakes her long hair. She is looking back at me as I drive by like she wants a ride in my vehicle down some back road. I am opening the door like a singer at the Opry, just for her.